I reviewed the first five volumes in this momentous and musically rewarding project earlier this year. With steadfastness and no hint of corner-cutting Olympia have since then issued a further four volumes all of which are reviewed here. The complete sequence has all the shock of the new. That said, Svetlanov himself issued, via Records International, a very limited run (300 units only) of the complete sequence back in 2000. This Olympia intégrale is however the first generally accessible production. In this present batch the world premiere recordings of symphonies 20 and 26 appear alongside the first ever issue of the Pathétique Overture. When Svetlanov went into the concert hall just over a decade ago it was very much to complete the sequence he had started back in the 1970s rather than to re-record every symphony. Thus his small handful of earlier analogue recordings have been interpolated into this sequence. None of these appear in this quartet of discs. The discs are laid out with Symphony No. 1 appearing in Volume 1, No. 2 in Vol. 2 and so on. Thus we find the Sixth Symphony in Volume 6. Before that 62 minute symphony we come to a work Miaskovsky wrote to mark the thirtieth anniversary of the Red Army: the determined Pathétique Overture. After a typically downbeat introduction comes an equally typical cavalry (or more likely tank) assault. Rather as in the finale of the Twenty-Sixth Symphony there are moments hinting towards Tchaikovsky's 1812 but at the zenith comes a grandly expansive heroic theme in which nostalgia and nobility meet in a manner worthy of the symphonies. This is very much a concert overture with the umbrageous mien and foreboding of Berlioz's Les Franc-Juges and of Rachmaninov's Isle of the Dead. The final five minutes are rather brash but nothing more than you might find in Liszt and the effect is moderated by that grand heroic theme (strong - though not of the high creative quality of those to be found in the 20th, 24th and 25th symphonies) which rises in brassy Baxian splendour over a vulgarity that is quaintly Beethovenian and Tchaikovskian. The towering Sixth Symphony is given a tempestuous, whipped and fleet-footed reading - furious rather than light-hearted - the sort of speed you might have expected from Golovanov on an impetuous day. Would that Svetlanov had found this pacing for his recording of the Fifth Symphony which lumbers and lingers ineffectually by the side of Konstantin Ivanov's classic and still supreme version on a long deleted Olympia (1987 OCD133) - a version to convince you of Miaskovsky's mastery. It also pales beside the very good Balkanton version (030078, June 1989) and Edward Downes's Marco Polo on 8.223499. However, back to the Sixth. This version is up against Järvi's recent DG recording which is better recorded than this and is not quite as molten. Frankly you will get on well with any of these. The Dudarova (on a previous Olympia OCD510) is better than serviceable and well engineered but lacks the imaginative heft to be found in the other recordings. Oddly enough Dudarova was in the Ostankino recording studios in July 1992 while Kondrashin was in the middle of recording the Miaskovsky cycle. Kondrashin's mono Sixth on Russian Disc (if you can find it) is revered but its mono tracking and sound quality renders it of historic value rather than being recommendable in the face of this Svetlanov, Järvi and the still surprisingly good Stankovsky (Marco Polo). Given that Stankovsky is a degree cooler than both Järvi and Svetlanov it is between Järvi and Svetlanov. If you want the work with the choral finale then go for Järvi; if you are content with the orchestral only version (and the choir�s role is only in the finale and then very brief) then Svetlanov on Olympia is the one to opt for. The 25 minute Seventh (in two movements) is dwarfed by its mighty predecessor. It too rattles cages but the darkling pages are this time alive with distressed echoes of Ravel's La Valse and distorted reflections of Tchaikovsky's Fifth. The work opens in an uncanny image of the start of Bax's Second Symphony premiered in Boston by Koussevitsky during the mid-1920s. Bass accented strings shudder, pregnant with bleak tension. The work plunges and charges along. Relish some thunderously chesty dense string tone at 6.38 in the first movement! The Sixth has its ineffably nostalgic themes and one of equal quality is used in the second movement of the Seventh. It is like a tender memory of childhood - a fragile distortion of Bye Baby Bunting. It is deployed twice and with most effect at 9.09. It is absorbed within a black protesting storm of noise and fades into the ticking of the clock evoked by the harp (a much used instrument in this work). The work ends with a Ravelian snarl and a lump in the throat. There are alternative versions of the Seventh. The 1976 recording by Leo Ginsburg and the USSR Radio SO is belligerent, tender, urgent and imperious but age is beginning to tell and besides this AAD reissue on a 1980s Olympia (OCD163) is long gone. Still, if you see it in a secondhand bookshop do pick it up. It plays for 23.30 as near as dammit to Svetlanov�s own timing. Halász takes a couple of minutes longer but has the superbly transparent, lucid and powerful acoustic of the Slovak Hall on his side though even that is trounced in terms of clarity by the Svetlanov recording - especially luminous in the Bax-Dvoř�k woodland idyll of the andante. Earlier mentions of Bax prompts one passing thought. While we will now never hear Svetlanov conducting a Bax symphony I still cherish hopes that one day Vassili Sinaisky might record Bax's Second and Sixth symphonies with the Russian Federation Academic Symphony Orchestra. They have a grip, potency, sense of the macabre and of the hysterically emotional that is extremely apt to Bax�s wayward imagination. The Seventh's disc-mate is a work from 1948 in which Miaskovsky replied to 'justified criticism' - the 'encouragement' of the Party's 1946 denunciation of 'formalism'. The Twenty-Sixth Symphony looks back to Balakirev's Overture on Three Russian Themes, to Borodin's In the Steppes of Central Asia to Rimsky's Antar and to the rustic courtliness of the Glazunov symphonies - even to the central movements of his own Eighth Symphony. This is termed a symphony 'on Russian themes' rather along the lines of the Twenty-Third and Prokofiev's Kabardinian string quartet (No. 2). The third movement and its predecessor have a melancholy droop that, in the case of the third, is almost Dowland and is close to Elgar on more than one occasion. It is played with fiery flair. The RFASO's trumpets, horns and brass choir play their uproarious hearts out in a jubilant conclusion with, not for the first time, just a hint of 1812 vulgarity about it. The Eighth was previously recorded only once, on Marco Polo (8.223297) with Robert Stankovsky conducting the Czechoslovak Radio SO. This recording was made in 1989. Between the gloomy harmonic complexities of the Seventh and before the dissonances of the Ninth this represents an innocence and folk-like character woven with the essence of folksongs. The note mentions Rimsky-Korsakov's volume One Hundred Russian Folk Songs. The Slavonic striving, toil and turmoil are painted in characteristic style in both the first and fourth movements. After a stormy scherzo there comes a Ravel-like Adagio - a real gem with a succulent role for the cor anglais. The song, which is of Bashkiri origin, is sad and lovely perhaps rather Bax-Irish too. This is the movement that will have you coming back for more. The last movement ends with some thunderous smashing impacts which are allowed to resonate freely - half reflective of the end of Rachmaninov's First Symphony. The premiere of this work was given in Moscow on 23 May 1926 conducted by Konstantin Saradzhev. The one-movement Tenth was premiered by the conductorless orchestra, Persimfans on 2 April 1928. Miaskovsky wrote it after his one and only journey outside the USSR when he went to Vienna to sign a contract with Universal Edition. It is a work of stress and turmoil, struggle and dissonant violence, rising from idyllic solo violin lines and resolved darkly with the skull visible behind the flesh of the face. This same dissatisfaction and striving also plays over Prokofiev's Third and Fourth Symphonies. Against the grain Svetlanov favours rapid tempi. He is 1.15 faster than Halász on Marco Polo (8.223113) and about two minutes faster than Rabl on Orfeo C 496 991. Svetlanov grasps the close parallels with Sibelius's virtually contemporary Seventh Symphony in the short upward notes at the start. His is a defiant performance but his warm acoustic is not to be preferred to the transparently recorded Slovak Orchestra in a hall whose audio qualities I have had cause to praise every time I hear the Marco Polo Moyzes symphony series. Rabl's recording is rather congested by comparison. The Ninth Symphony was dedicated to the conductor Nikolai Malko but premiered in Moscow under Konstantin Saradzhev on 29 April 1928. Its Andante sostenuto depends on one of those wide-ranging long yearning melodies played surgingly and with flowing, tender and sombre power by the strings. The headlong death's-head presto is Mahlerian with a jejune tune that, to Western ears, sounds like a conflation of 'Boys and girls come out to play' and 'On Christmas Day in the Morning'. Here the strings sound more strident than usual; they glare somewhat. The lento molto third movement has another of those long sinuously turning tunes which Rimsky or Borodin would have given their eye-teeth to have written. It is played with a lustrous sheen that seems to radiate a halo - just listen to 7.49 tr 3 - a thing of beauty making this disc (vol. 9) - a must-have. The finale (allegro con grazia) is shaped as if a Mahlerian ländler with hopping rhythmic figures and a joie de vivre that is a mix of Dvoř�k and Richard Strauss. This jollity is soon remorselessly dissected - deconstructed into a pessimistic rhapsodising violently dispelled by the return of the hopping jauntiness of the start of the movement. This does not work as well as it might and, strenuous though it is, lacks conviction. The piece ends with a Baxian bawl. The Ninth has also been recorded by Edward Downes (a Russophile specialist well versed in the literature and idiom). His orchestra is the redoubtable BBC Philharmonic soon to embark on a complete Chandos cycle of Bax symphonies with Handley. This estimable version of the Ninth is on Marco Polo 8.223499 (recorded 1 December 1992 in Manchester). Svetlanov tends to take things more broadly (his version runs for a good five minutes longer than Downes). Svetlanov's husky and velvety recording suits the music very well and neither performance sounds unnatural, rushed or too languid. If pushed I would favour the Svetlanov. In any event although Downes's coupling, the Fifth Symphony, is good, it cannot match Ivanov on that old Olympia. Svetlanov's Fifth on Olympia Vol. 5 is out of the reckoning. One of the few misfires in the project. The Twentieth is vibrant with the exhilaration of bell towers. It has one of those blessed gifts of a theme, wholly Russian, haunting, exultant, nostalgic, plangent, sad and poignant with an exalted spirit lofted high by a blaze of strings and a supreme brass choir. How can this symphony have 'wasted its sweetness on the desert air' for so long? This session must have left everyone exhausted and amazed. Of the four discs in this group this stands out as the one to sample. As a work I would place No. 20 with Miaskovsky's strongest: Fifth, Sixth, Twenty-Fourth and Twenty-Fifth Symphonies - such are its powers. The next two volumes (10 and 11) are due to be issued before Christmas. The recording qualities running through the digital parts of the cycle are always good in a grand-hall sort of way; resonant and lively, though with a tendency to play up the denser string textures. When complete there will seventeen volumes in this series. 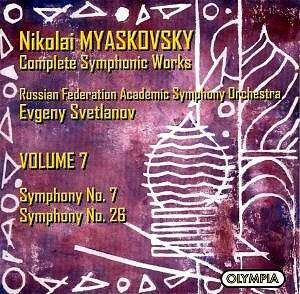 Seventeen happens to be the number of characters in the name 'Nikolai Myaskovsky' and this happy coincidence is exploited by Olympia putting one character of the seventeen at the foot of the spine of each disc case. When you have all seventeen the name will be spelled out on your shelves. A nice, though inconsequential, touch. There has been a flurry of new Miaskovsky releases of late. DG gave us a stunning Sixth Symphony from Järvi and the Gothenburg Orchestra while, in October, Chandos issued Polyansky and Ivashkin in very strong versions of the Cello Concerto and the last symphony. The latter was perhaps a canny move by Chandos providing a digital 27th in face of Svetlanov�s ADD version when issued by Olympia. The long-rumoured Marco Polo CD of symphonies 24 and 25 surely cannot be far from issue date. The DG and Chandos contenders are good signs for Miaskovsky's future spelling a modest upward gradient by the supra-national labels. There is a welcome symmetry and justice to the digital masters of this series falling to Francis Wilson's and Jacki Campbell's Olympia label. 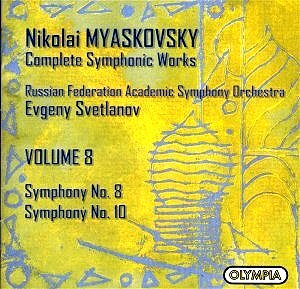 Olympia supported Miaskovsky virtually from the dawn of the compact disc era. Their rejuvenation of the Melodiya heritage of the 1960s and 1970s became a byword in the 1980s. Not content with that Olympia even made new Miaskovsky recordings with Dudarova and Samoilov. Technical problems strangled off the issue of a Rozhdestvensky disc coupling symphonies 1, 15 and 21. It even had a catalogue number but never made it to the shops (unless you know better). Though, very sadly, those Olympia originals (all AAD) are now long gone (presumably licence-expired now) they can still be found in secondhand stores. They include a raw but unbeatable Fifth Symphony from Konstantin Ivanov coupled with Dudarova's rather more relaxed but still very effective Eleventh Symphony (OCD133). There is also the Third Symphony conducted by Svetlanov on OCD177, the Violin Concerto and the Twenty-Second Symphony on OCD134, Svetlanov�s version of No. 27 on OCD168 (all four issued in 1987) and the Seventh (Ginsburg) coupled with orchestral music by Lev Knipper (OCD163). The Ivanov Fifth, despite its antiquity, is the one by which to measure all others. Feigin's version of the Violin Concerto was only slightly less desirable than the mono Oistrakh (on Pearl) and had the advantage of Svetlanov's Twenty-Second Symphony and of a vital and ardently rendered performance. 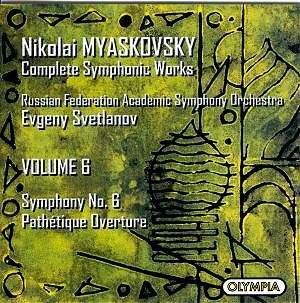 When the present Svetlanov series is complete I hope that Olympia might consider reissuing the Concerto (Feigin) harnessed with Ivanov's Fifth Symphony as a tribute to some historic Miaskovsky interpretations. Per Skans' programme notes (English, French and German) continue to be a pleasing and authoritative presence linked back into Russian artistic and political history. Back to the present four discs. These represent another blithely rewarding salvo from Olympia. If you must limit yourself to one then go for volume 9 but my guess is that you will very soon want all the others. The experience of hearing these seven symphonies and one overture and comparing them with previous recordings has made for a very satisfying weekend. Miaskovskians will be way ahead of me. Others with a taste for Twentieth Century exotica from Northerly climes will want these discs. No collection is complete without this version of the Twentieth Symphony.